Visitors can soak up the spirit of the Gatlinburg Winter Magic season from the comfort of a Gatlinburg Trolley by taking the relaxing Trolley Ride of Lights. The specially designated trolleys carry their guests on a memorable journey through downtown and adjacent Hwy. 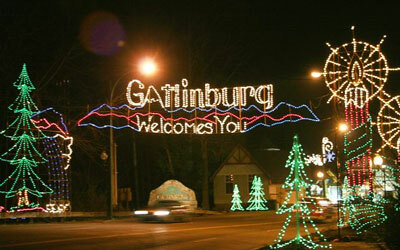 321, allowing everyone to experience the magical wonder of Gatlinburg Winter Magic. Trolley times are at 6:30, 7:30 and 8:30. Displays featuring animals indigenous to Great Smoky Mountains National Park including deer, foxes, squirrels and rabbits are part of the program. Many of the timeless displays visitors have grown accustomed to over the past 23 years have been converted to crisp LED as well. Most recently, fanciful snowmen, dancing fountains, a group of international children and a shiny rocking horse have joined the lineup.